This Saturday, July 5 features the final two of the four quarterfinal matches for the 2014 World Cup and starts with the 12:00 noon game between Netherlands vs Costa Rica. The theme of group winners continuing into the quarterfinals sticks with this match-up as well. Both teams needed to qualify for the knockout rounds by advancing past stiff opposition and both ended up in positions that most did not expect at the start of the World Cup. However, the similarities mostly end there. Costa Rica were expected to finish last in their group while the Netherlands has enough cred to have left them open to a likely second place finish. Costa Rica has become quite a surprised and they are hoping to continue to shock their European competition in yet another match. So far, they are undefeated against European teams including 2 wins and 1 draw, but have scored just two goals in this time and allowed one. They have set themselves up as a team very difficult to break down, while being quick to counter. There are several quality players with excellent technical abilities in this team, but the key is that they do manage to play well as a team and work hard for one another. 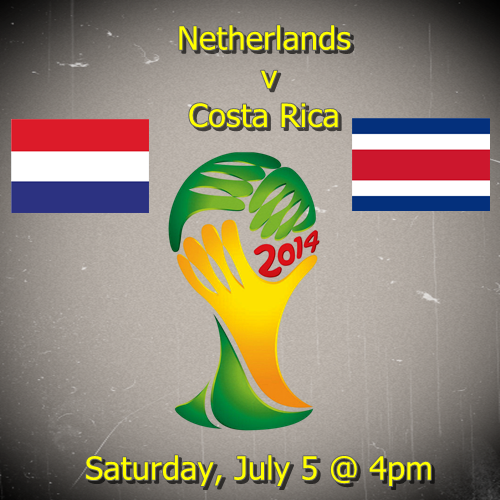 Costa Rica typically sets up with a 5-4-1 and rely on their main goal scorers Joel Campbell and Bryan Ruiz. The Netherlands has made it to the quarterfinals by playing a very tactically flexible game. The preferred formation is something like a 3-4-1-2, but this is often loose and highly flexible based on the flow of the game. This includes the use of wingbacks that can quickly transition from defense to attack as necessary. So far Arjen Robben has had a blistering tournament and will, again, be a key player for Holland. While everyone knows exactly what he’s going to do, cut inside to his left foot and shoot, very few can actually stop him from doing it. His pace and vision are extraordinary and have been the big difference for the Netherlands. This time around, they will need more than just Robben. Sneijder finally scored in the last round, but Robin van Persie was non-existent. While he does have 3 goals this World Cup, those all came in their first two group stage matches. These two will need to step up and show their quality if they hope to advance. My prediction is a Netherlands win. It will not be easy and Costa Rica could certainly push them as far as penalties. There is every chance that the Ticos could even pull off another upset win, but this one will not be easy. Both of these countries play well as a team and both will need to do so in Saturday’s match. The difference in this match will be the individual brilliance and which team will have the better individual performance to carry their team forward. The Netherlands will be missing a key component with Nigel de Jong out for the remainder of the World Cup with a groin injury. His ability to break up play in the midfield and get the ball to the attacking players will be sorely missed. On the other side of the pitch Costa Rica will be without center back Oscar Duarte who picked up two yellows against Greece and will be suspended.